Peonies make wonderful cut flowers. The blooms are large, soft, silky and romantic. They can be found in a range of soft colours, and a few brighter ones, making them ideal for weddings, as well as for placing in the house. In many ways they are better as cut flowers than roses, but the season is very short. Peony flowers are only available from late May and through June. But in water they will last far longer than a rose. 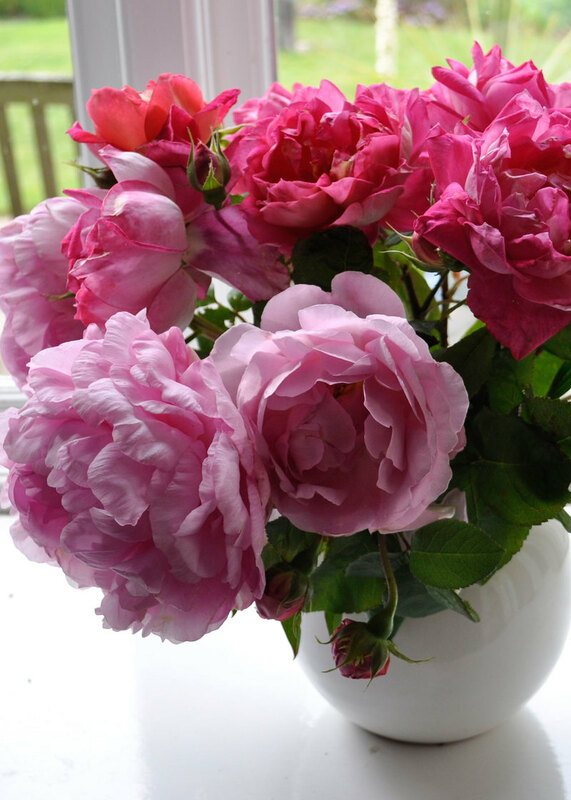 If you want to grow peonies for cutting patience is needed. Generally it will take up to 3 years for the most cut varieties to produce enough blooms for cutting. Some may take 5 years. For instance, after 3 years ‘Myrtle Gentry’ produced around 12 stems when grown in sandy ground, whereas ‘Coral Charm’ only produced 3 stems. However, as the flowers are large, the average vase really only needs a few blooms to look both beautiful and opulent. Contrary to what is often written about peonies, they are easy to grow in almost any soil that isn’t water logged, but they do like a sunny position. Richer soils are better than poor soils that do not retain water. Having said that at the moment we are growing our peonies on an exceptionally well-drained sandy soil and the plants are great. It is important to start off with reasonably large plants. We always try to send out plants with at least 3 eyes (the red shorts), but with some hybrids (such as 'Coral Charm') this can be difficult because of the way they grow. Over the years I have wandered through our peony field and cut flowers at random. Red varieties are generally not good in a vase, although 'Paul M. Wild' is better than most. The petals desiccate quickly, resulting in a shrivelled look, and the petals of some of the Japanese types just fall off. The soft coloured double ones, of which the famous and robust grower ‘Sarah Bernhardt’ is typical, seem survive best as cut flowers. Peonies can be cut in bud (at the ‘marshmallow’ stage), but because I want to see what the flower is going to be like I tend to cut them when they are just opening. I never ‘condition’ them (too much trouble), I just thrust them in a vase and enjoy their beauty. The varieties I have recommended below I have found will last in a vase from 6 to 10 days. These are just a few varieties of the many I could recommend. ‘Elsa Sass’ has thick, waxy, pure white petals that form a cup around a dipped centre. The petals dry up eventually. ‘Pink Dawn’ is unusual as I have found few single peonies that are good in water, they loose the petals quickly, but this is good. The flowers are white with soft pink speckles, carried on stiff, upright stems.